This iMac has the same Tapered Edge design as it's predecessor but with Intel's more advanced Fourth Generation processor and architecture. With it's Core i7 processor, this iMac will run all of your demanding applications at the same time and with out any issues. This is also including dedicated graphics which will speed up lots of 2D and 3D rendering! The Apple iMac 21.5" Core i7 3.1GHz Late 2013 is a great spec, high quality iMac with a sleek, stylish design featuring a razor-edge 5mm Tapered Edge. This iMac also boasts dedicated graphics with NVIDIAs GeForce GT 750M! Great for business and casual users, it’s secure and user friendly. This iMac will allow you to easily browse the internet, update social media and access a range of office applications (Word, Excel or non-Microsoft alternatives) to complete either your business or school work. With the ability to run programs like Adobe Photoshop and Logic Pro X with ease this is a perfect choice for all intensive design purposes. It is worth mentioning that this model also features an in-built microphone and webcam for video conferencing and video calls. In summary, it is a brilliant all-round performer at excellent value. Is the Apple iMac 21.5" i7 2013 right for you? It’s a durable and easy to use model that includes all of Apple's great feautures such as locktight security and reliability. If you need an All-In-One to complete office work, or study for your school, college or university education, then it is the perfect machine for you. With it's Core i7 processor and dedicated graphics it makes for a sturdy workhorse with great performance. One of the main benefits of course is the price - a refurbished model, it gives you the experience of ‘like new’ for a reduced price. 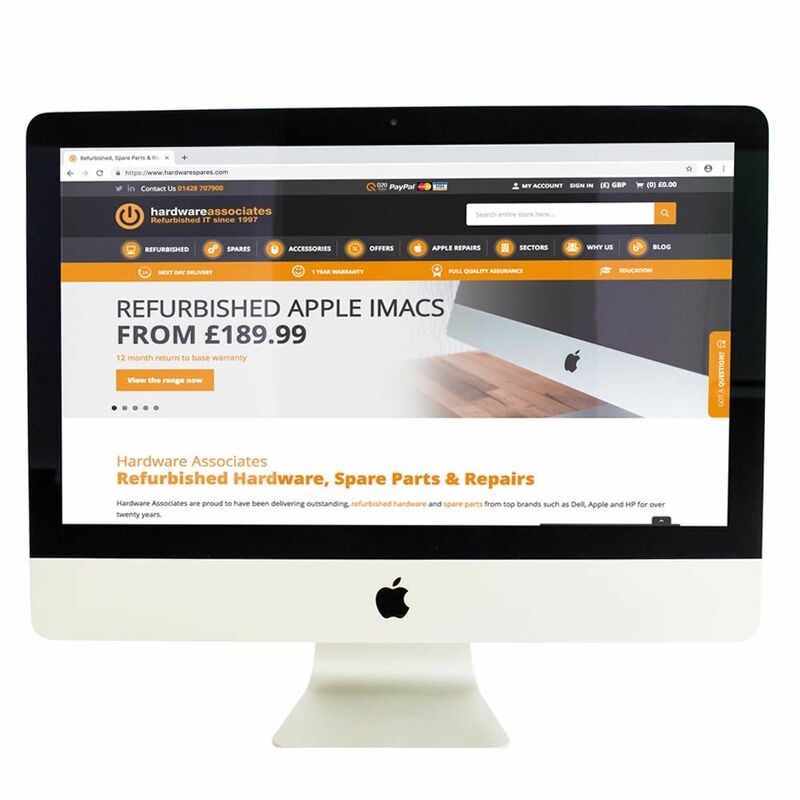 If this would be your first purchase of an Apple iMac and you want to find out more about this leading IT brand and what they offer, please click here. At Hardware Associates, our stock has been refurbished and is as good as new. It works perfectly, may have some marks or scratches and around the exterior but we guarentee that there will be none on the screen. The Intel Core i7-4770S was lauched in 2013 and offers a reliable processor for your iMac, with great performance and a reduction in power usage from earlier generations.